This savory dish was adapted from the WILLIAMS-SONAMA COOKBOOK. To marinate the meat, rub the meat with olive oil and a mixture of spices. Let sit at room temperature for an hour or overnight in the refrigerator. To make the stew, in a heavy Dutch oven, brown the meat in butter and oil. As the pieces brown, remove from the pan, and brown more pieces. When all the pieces are brown, quickly pour in a cup of wine if desired and scrape up the brown bits on the bottom of the pan. Stir in the onions, carrots, and turnips to lightly coat in the fat and brown slightly. Stir in the tomato sauce and water. Season with salt and pepper. Let simmer 30 to 40 minutes. Stir in the green beans and zucchini and let cook gently another 10 minutes. Add hot sauce to taste. Meanwhile, spread the couscous in a rectangular baking pan. Pour over 2 quarts of boiling water. Stir in half a tsp. of salt and the butter and cover with foil. 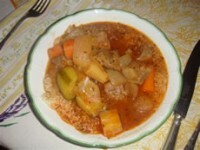 The stew should be served over the couscous on warmed plates or bowls.